Teething has got to be one of the cruelest rites of passage for children to endure and they must go through it TWICE! Lily began teething when most babies do but didn’t get her first tooth until she was close to a year old. She got them out of order – her upper eye teeth were first and looked like fangs (she could’ve been the Twilight baby!) but she got quite a few in all at once. You would never know this kid was teething while she cut her incisors, eyes, and even pre-molars! But when she began cutting her 2 yr molars and canines- oh boy! She now has 14 teeth and has 6 to go. These last teeth have been awful- creating high emotion, restlessness and even a hunger strike! They say that as teeth begin to emerge they cut through the gum and go up and down a little before finally agreeing to stay out. Now that’s just plain mean! But with teeth come new things to discover- different foods, a smile that looks so much more grown up, brushing your teeth and of course, the dentist! Lily’s first visit to the dentist was fun. Well playing on the pirate ship in the waiting room was fun, getting a goodie bag was fun, laying in the lap of the dentist- not so fun! The dentist counted her teeth and looked them over much to Lily’s dismay. We received a good report and were sent on our way. 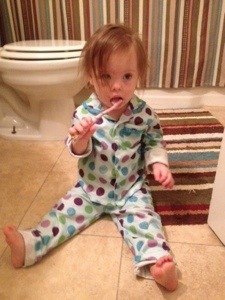 Seeing the dentist may not be on Lily’s list of fun activities but brushing her teeth sure is! She brushes her own teeth in the morning and I brush her teeth at night. Any time anyone runs the bathroom sink, she races over and points to her teeth signaling she is needing to brush! I sure hope we can continue this enthusiasm! 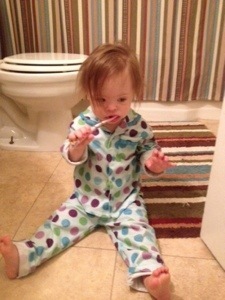 This entry was posted in Down Syndrome Awareness Month and tagged dentistry, Down syndrome, teeth, toddler, Toothbrush. Bookmark the permalink. awwwww I love the picture of her brushing she such a big girl…Thank you so much for shareing Lily kalyn she is a amazingly cute funny sweet princess just love her to peices.Ryder i have to literly hold down for teeth brushing….so GOOOOO LILY!!!!!! As you can see, I write a blog for differently abled children called IncredABLE Toys. I haven’t yet thought to write about teethers. Were there any teethers that worked particularly well for Lily? If so, I would love to tell my readers about them! Or you can! There’s a tab at the top of my homepage labeled “Share Your Toys!” If you’re willing, I would love for you to leave a response there. What are Lily’s favorite things to play with? How wonderful! I will check out your blog and leave a comment regarding Lily’s teethers of choice. 🙂 Currently Lily really enjoys pretend play with animals and her animal farm or her baby doll. She also really enjoys doing puzzles and reading books! P.S. I have a younger brother who has Down Syndrome. He largely inspired my blog, and is the reason I was searching “Down Syndrome” when I came across yours.